World War I Bridges - WW1 Centenary from the river Piave: The time and space of the Great War. Some notes on Stephen Kern's book "The culture of time and space, 1880-1918"
The time and space of the Great War. Some notes on Stephen Kern's book "The culture of time and space, 1880-1918"
We stated that the military equipment was not on the top of our minds when we launched this web adventure called WWI Bridges. If that was and is true, we should step by step indicate what moves and motivates us towards the Great War, without running the tremendous risk of intellectualizing a tragedy (unfortunately not so infrequent, even in the publishing industry or in the above suspicion academic environment). For sure the First World War was a kind of historical "crest" of the modern times. And it was a crest also in the conception of time and space, a turning point, no way back. Sometimes we should go beyond the titles of the books. 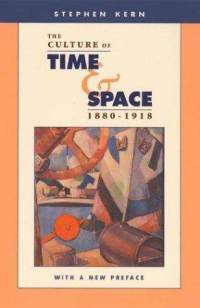 Take for example The Culture of Space and Time, 1880-1918, published nearly thirty years ago, in 1983. It’s not a book fully dedicated to the First World War, even if the period mentioned in the title is pretty meaningful, but inside this book you will probably discover one of the most memorable analyses of space and time of that Europe sinked in the trenches. The pages dynamically resolve through a careful meditation that goes back and forth between the technological changes and the new culture embracing the last two decades of the Nineteenth century up to the end of the Great War. Kern keeps a constant cross-reference to the notions of form, distance, limit. In this frame, we can read the thirty page chapter dedicated to the crisis of July 1914 and to the subsequent outbreak of the war. What is really impressing in Kern’s prose is the contrast between the exact, precise time of diplomacy, ultimatum and of the attacks (all watches were synchronized to guarantee the simultaneous assault of the troops) and the “remaining” time of wait and inactivity. The time of diplomacy on one side and the time (and space) of the trenches on the other. It was a kind explosive mixture, among many others. All is condensed in that final image of the chapter: a continent - Europe- moving towards the war at a ragtime rhythm. The final chapter, The Cubist War, is the natural attempt to close his analysis, in a square bounded by space, time, speed/slowness and technologies.